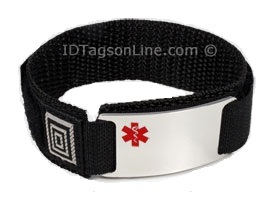 Stainless Steel Sport ID Bracelet with colored Medical Emblem Stainless Steel Sport ID Bracelet. Premium Medical ID Plate with clear Emblem. Sport ID Bracelet, IDSP20 (ID Tag size 1-5/8" x 7/8"), is made from .062" thick premium grade Stainless Steel. It is guaranteed to be rust free for life. The medical logos come in either red or blue colors or clear emblem.